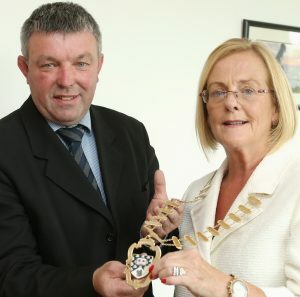 STATEMENT: Cllr Joe Queenan handing over the chain of office to Cllr Rosaleen O’Grady earlier this year. Cllr Queenan has made a statement in response to an RTE Investigates programme this week. fair and honest account of the conversation that took place between myself and this undercover reporter. to them and do something with the officials or, I can’t”. nothing. I am not looking for anything out of it”, “I will work with ye. Free gratis and for nothing”. options in relation to this matter. allow me to continue to be active in those areas into the future.